Homeschool alumni founded two advocacy organizations in 2013: Homeschool Alumni Reaching Out (HARO) and the Coalition for Responsible Home Education (CRHE). These organizations have different missions—CRHE is oriented toward research and policy while HARO is oriented toward awareness and support—but sometimes work together on specific projects. As the two are sometimes confused, this post lays out the differences (and similarities) between the two organizations. CRHE is a 501(c)3 nonprofit incorporated in Massachusetts. HARO is a nonprofit incorporated in California. CRHE encourages alumni to support current and future homeschooled students by working toward oversight and accountability for homeschooling. CRHE invites alumni to submit personal testimonials, volunteer, or serve as advocates. CRHE also provides homeschool alumni with information on academic credentials and continuing education and points alumni to HARO for support and networking. HARO offers peer support for homeschool alumni through its Homeschoolers Anonymous blog and its online Facebook and forum communities. HARO aims to develop resources for struggling alumni including life coaching, counseling networks, and scholarships. CRHE provides homeschooling parents with information on recognizing and reporting child abuse and educational neglect. 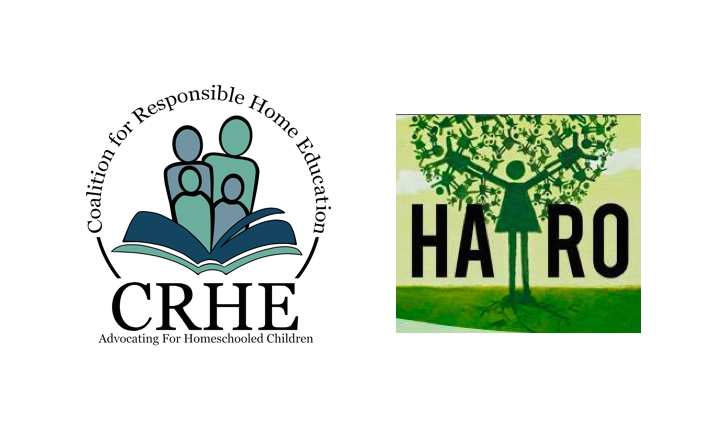 CRHE creates resources that promote and support responsible homeschooling. Finally, CRHE urges homeschooling parents to support legal oversight of homeschooling and works with homeschooling parent allies to accomplish the same. HARO develops curriculums on child abuse prevention, mental health and suicide prevention, responding to self-injury, and other such issues. These curriculums are intended to be taught in homeschooling co-ops and support groups. CRHE advises individuals who suspect child abuse on how to report their suspicions and provides information on how to recognize and report educational neglect in homeschooling environments. When appropriate, CRHE refers contacts to HARO or to HARO-produced resources. HARO advises any individual with a reasonable suspicion of child abuse or neglect to report thier suspicions and puts them in contact with trained professionals. HARO is happy to connect alumni who are legal adults with online communities and resources. CRHE provides information on child abuse definitions, warning signs, and reporting. CRHE maintains the Homeschooling’s Invisible Children database, outlines common themes in the abuse of homeschooled children, and conducts original research on child abuse in homeschooling environments. HARO provides practical training and free curriculums for homeschooling parents to learn how to recognize and respond to child abuse in homeschool situations. CRHE provides information on how to recognize and report educational neglect in homeschooling environments. CRHE conducts original research on educational neglect in homeschooling, the prevalence of different types of educational neglect, and solutions to problems related to educational neglect in homeschooling. HARO provides practical training and free curriculums for homeschooling parents to learn how to recognize and respond to neglect (whether educational or otherwise) in homeschool situations. CRHE makes policy recommendations and advocates for greater oversight of homeschooling. HARO does not advocate for or against public policy. CRHE’s scope of advocacy does not involve positions on LGBT* issues. However, CRHE opposes the use of homeschooling to isolate, abuse, or harm children, including LGBT* kids. Educating homeschooling communities about how to better foster a safe educational environment for LGBT* homeschool students is a specific part of HARO’s advocacy work. CRHE conducts original research on academics, child abuse, and policy. CRHE runs the Homeschooling’s Invisible Children database. HARO conducts occasional surveys of homeschool alumni and partners with CRHE for data analysis. (1) You are concerned about the wellbeing of a homeschooled child you know; (2) You want more information about your state’s homeschooling laws; (3) You want to know how you can help advocate for better oversight of homeschooling. (1) You are interested in how the homeschooling movement can enact internal changes to become a safer and more nurturing enivronment for children; (2) You would like training or curriculums to educate your homeschooling community about issues like child abuse and mental health; (3) You want to participate in or contribute to support networks for homeschool alumni.